There are a ton of credit cards out there, from credit cards for those with bad credit to rewards credit cards and beyond. They are offered by a number of card issuers for a myriad of reasons. So that brings us to a tough question, “what credit card should I get?” This depends on a number of factors, including your credit history and credit score, and also what you’re interested in. Some decisions will be determined by the credit card issuers themselves if you have less than stellar credit or insufficient credit history. In this case, you may not have much say in what credit card you should get. You may have to take whatever they offer, and even pay an annual fee to do so. Conversely, if you stay on top of your credit and keep your scores up, you’ll be able to apply for and receive nearly any credit card you wish. So what credit card is right for you? Well let’s break it down into categories. This category, also known as bad credit credit cards, is applicable if you have an insufficient or poor credit history. Unfortunately, these types of cards are riddled with fees, such as annual fees, monthly servicing fees, credit limit increase fees, application fees, program fees, and other nonsense. For that reason, it’s best to avoid these if at all possible. Although most card issuers are pushing consumers towards the fee-based unsecured credit cards these days, you may be able to get a secured credit card instead. This is basically a credit card where you provide cash collateral in return for a credit line. So if you provide $500, your credit line will be $500. Once you’ve proven that you can make on-time payments for a specified period of time, the bank or issuer may raise your limit or give you an unsecured line of credit. Just make sure the credit card is being reported to the credit bureaus so you get, ahem, credit. If your credit history is limited, or your credit score is poor, inquire about a bank-issued credit card instead. This may be a better option than going with a high-cost credit building credit card or a secured credit card. You can still build your credit this way, but without all the costly fees. Chances are your bank will approach you about this type of credit card when you open a checking/savings account, as they know you have money. These also serve as partial overdraft protection. Student credit cards are generally reserved for those with limited credit history, not bad credit history. They often carry high APRs and limited credit lines, so they aren’t the most ideal. However, recently many of them began offering rewards, including cash back, with no annual fee. If you are a student with limited credit, this might be the choice for you. These credit cards are reserved for those with pristine credit and offer benefits such as extended warranties, car rental and travel insurance, travel assistance services, and zero liability for unauthorized purchases. If you have good credit (what is a good credit score), you should apply for one of these types of credit cards, as they offer more protection and value to the card holder. American Express will actually extend a U.S. manufacturer’s warranty of less than five years by an additional year if you use an Amex card for purchase. That’s a good deal for your ailing laptop. Just watch out for sky-high annual fees as seen on the Platinum Card. Rewards credit cards are another benefit of having good credit, as you can receive cash back or other rewards for spending using your credit card. My personal favorite is a cash back credit card, as it’s a no-nonsense money in your pocket type of deal. While travel and hotel rewards can be enticing, you often get stuck paying an annual fee. So they only make sense if you know you’re going to spend a lot on your credit card and use the rewards. Capital One offers airline rewards without an annual fee on some cards, though its popular Venture Rewards card does carry an annual fee. Another popular fee-based rewards card is the Chase Sapphire Preferred card, which offers up to $625 in travel rewards as a mere sign-up bonus! However, many cash back rewards cards carry no annual fee, so you can bring in money without having to pay to play. The old American Express Blue Cash Card currently offers the best cash back out there. And the Chase Freedom $200 cash back bonus is unmatched for a fee-free credit card. Tip: Find credit cards that waive the annual fee for the first year. If you already have a credit card, but are looking to move an existing balance to a low APR credit card, this will likely be your best option. Most credit cards have APRs in the teens, but if you have good credit, there’s an opportunity to move the balance to a new credit card with 0% APR or a super low fixed APR for the life of the balance. This makes more sense than paying a high APR on a large balance. Both Chase and Discover are currently offering no fee balance transfer credit cards, a great deal if you’ve got debt you need to pay off. You avoid finance charges for a full year, making it that much easier to pay it all off! They are limited time offers, so don’t wait. The downside of many balance transfer credit cards is they carry a fee, often 3% of the balance or more, meaning you must make a hefty payment upfront that will accrue interest. To avoid this, you may be able to transfer a balance without a fee to a credit card with a low, fixed interest rate. There are also some 0% APR no fee balance transfer credit cards still available that provide the best of both worlds. So that’s it. Hopefully this helps you decide what credit card to get. As mentioned earlier, there are literally hundreds out there, so take your time and do your research. Remember, it’s okay to carry more than one credit card, so you don’t have limit yourself if you need multiple cards for different purposes. Just be sure to always read the fine print before applying! 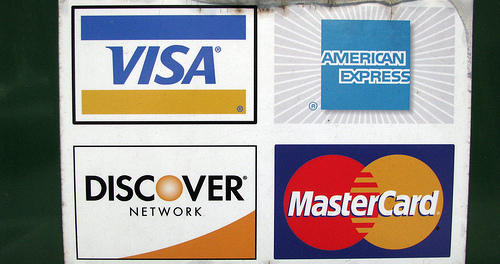 Read more: Compare credit cards pros and cons by company. I think this depends on what the person’s goal is. Like right now I want to earn cash back so obviously I’ll be applying for a cash back card. If someone wants to take a trip they will apply for a travel rewards card and so on.